Hi, there. Do you love Japanese food? And do you feel like having a special experience in Kyoto? 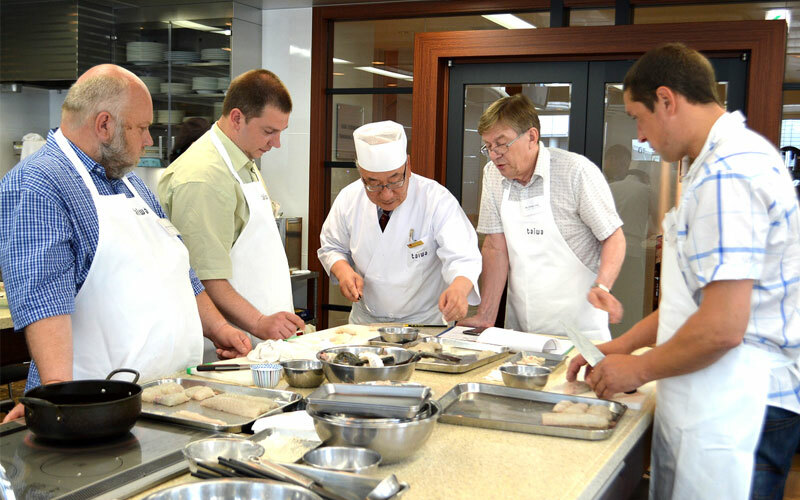 So why don't you join our cooking classes during your stay? 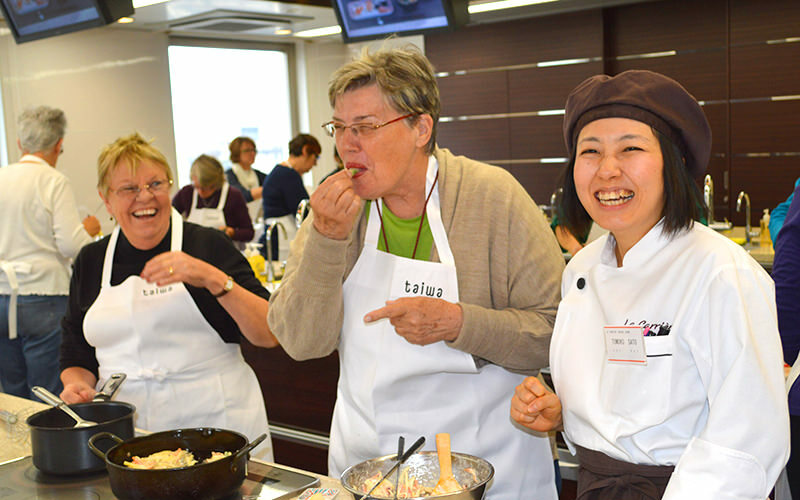 We can provide you a wide range of classes which you will learn from Japanese home cooking to the dish like we eat for a special occasion. Also, we can provide you a custom-made lesson which you could focus on what you are really keen on. La Carriere cooking school is where you can learn cooking, dessert-making, bread-making and flower arrangement while having fun in a small class. 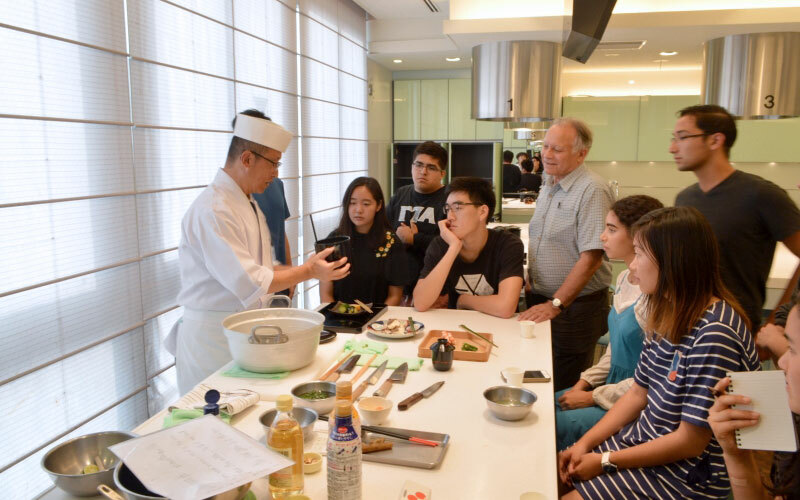 Established over80 years since1931, being the cooking school with longest history in Kyoto, our school is being loved in the community. These reviews were posted on TripAdvisor. Althea H said:I've been attending this class for six months, and as a foreigner I was worried at first about the Japanese. But it turned out all the teachers were extremely nice, and were making the lessons easy to understand even for me as a foreigner. They explained everything in good detail so there were never any problems, and thus I feel I learned so much from attending this class! I wish I was able to continue this class, which I definitely would if I wasn't going back to my country. 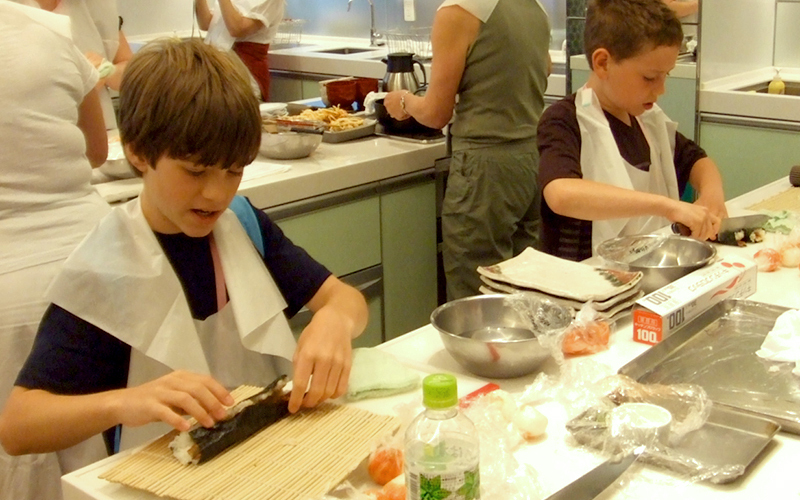 I recommend this cooking class to anyone wanting to learn more about japanese cuisine or just cooking in general! 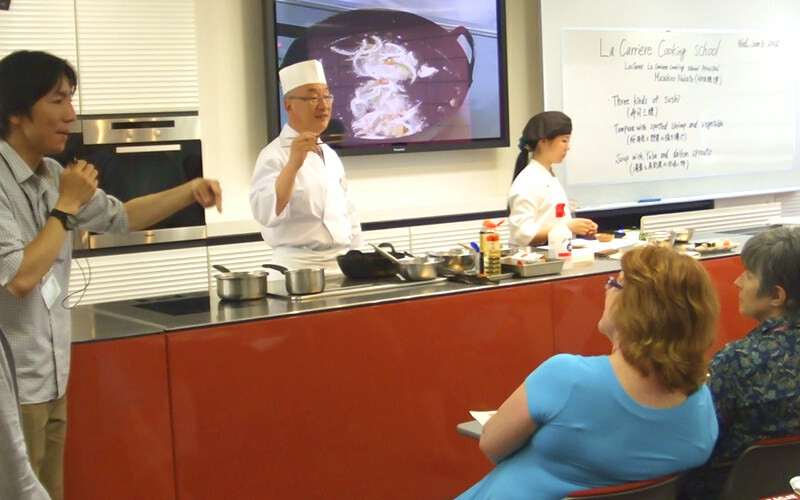 Alan A said:During my time as a study abroad student in Kyoto, I enrolled in La Carriere for weekly cooking lessons. Interpret this as you may, but classes are split up according to gender. Further, lesson prices are higher for female students than male students. The women have a wider selection of lessons at their disposal, while the ones that share the same content as men often have an extra dish incorporated into them. As a student, I received a generous 25% discount for my lessons from January to April. The lessons are divided up as follows: Washoku, Yoshoku, and beginner’s skills. Each month there is one Washoku class, one Yoshoku class, and two beginner’s classes. Since I cook frequently back in America, I went into the first month feeling confident about the beginner’s courses, but decidedly more nervous about the more specialized classes. For the first lesson or two, I would arrive an hour early and painstakingly translate the entire recipe sheets for the session’s two dishes. We were then directed to our demo room, consisting of 8 workstations made for two people apiece. At the start of the lesson, the head chef and his assistant would demo the entire cooking process for the night, referring to the sheets as needed and adding personal tips along the way. We would then be let loose, and working with our assigned partner (who changed every week), we would go through the sheets together and cook, assisting each other as needed. What I quickly discovered was that I only needed to know the names and Kanji for ingredients unfamiliar to me, while the actually procedure I could pick up by ear pretty easily from the chef. If I ever got hung up on something, all I would need to do is wave down either the head chef or the assistant chef, or simply ask my partner. Yoshoku lessons became my favorites, because they used a lot of ingredients and techniques that I was already quite familiar with back home. In addition, I developed a fast friendship with the chef that always headed those lessons, a Japanese man who cooked in France for a few years of his life. Of all the teachers I had this semester, he was the one who engaged with me the most. I kept all of the recipe sheets that I was given, and intend to use some of them again in the future when I’m cooking for myself. Over the course of the semester, I’ve learned a great deal more of Japanese vocabulary, gotten to know some new techniques, and interacted with people from a variety of backgrounds but united by a passion for cooking. Lessons are generally offered in Japanese only, although you can book individual English lessons as well. 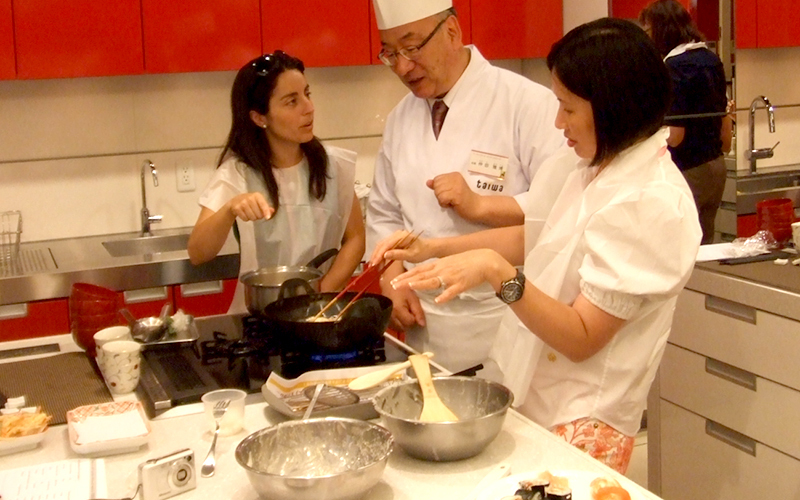 Private group lessons are also available -- the demos are done in Japanese, but your recipe cards are in both English and Japanese. Jmbowen0 said:I went here with a class and the instructors were very nice. They got us a simple that everyone can make and helped us through it. It was very delicious and well worth the trip. A wonderful experience overall. Phenyx310 said:This was really fun. They taught us how to make a dish and we got to eat it. They helped us through all the cooking. It was a very beautiful place. I would definitely do it again! It was very delicious. choki2448 said:chefs well qualificated.and thanks for the big screen they have which helped us a lot to watch easily the detail how they cook before we try.tools and kitchen are new and clean.we were big party, 56 of us.but we had enough chefs to instructs us which was great.difinetely recomend.